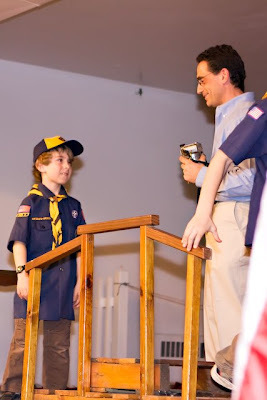 N had his annual Cub Scout Blue & Gold Dinner and Awards Ceremony this past weekend. 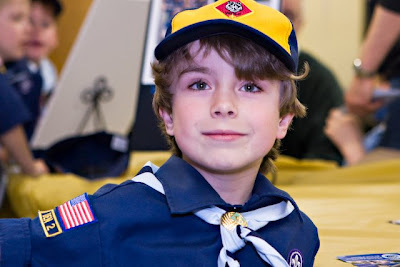 He has progressed from a Wolf Scout to a Bear Scout. He is very excited about this, especially because one of his den mates told him that as Bear Scouts they get Swiss Army knives. Um, I'm not too sure about this...I don't want to see what nine 8-year old boys will do with Swiss Army knives! In other news, M has moved out of her crib to a big girl bed! So far so good...no trips in and out of bed before she finally falls asleep (knock on wood!). J is doing well and our dog Samson seems to be recovering well from his cyberknife radiation treatment that he received last week. That's it for now...back to my Spring Cleaning (anyone interested in the 18 garbage bags of clothing that I have earmarked for Goodwill)!